The East Midlands, in its broadest sense, is the eastern part of central England (and therefore part of the United Kingdom as well). 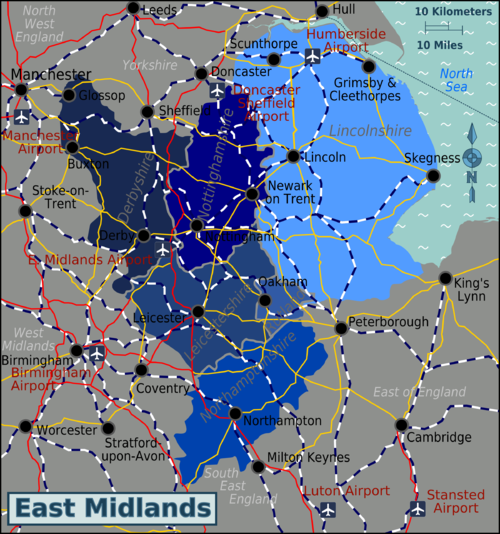 The East Midlands covers three major landscape areas: The relatively flat coastal plain of Lincolnshire, the river valley of the Trent, the third largest (and longest) river in England, and the southern end of the Pennine range of hills in Derbyshire. The second of these contains several large cities: Nottingham, Leicester and Derby all of which are historically centres based around coal mining and heavy industry. This is one of the drier regions of England. East Midlands Airport is close to Nottingham, Derby, Leicester and Loughborough and serves destinations in Europe, the USA and Caribbean, including low-cost carriers. It is a small modern airport with buses to the main cities nearby. Doncaster Sheffield Airport in Yorkshire is the closest airport outside the region. Manchester, Leeds Bradford and Birmingham airports are also easily accessible. Of the London airports, Luton and Stansted are most convenient. Trains leave Luton airport hourly and take is 1 hour to Leicester and 1.5 hours to Nottingham. Stansted has hourly trains to Leicester that take 2.5 hrs. The M1 motorway provides direct access from London, Sheffield and Leeds to the region and each of its three main urban centres. The Peak National Park: Named after a local tribe, this area contains only rounded hills. This national park is dominated by bleak "Edges" of hard rock, and caves of limestone at Castleton in Derbyshire. The village of Eyam is famous for the villages isolating themselves to prevent the spread of plague to other villages and contains significant items of historical interest. There is a good walking trail in this area. Nottinghamshire contains the remnant of Sherwood Forest, alleged home of Robin Hood. Although much of The Sherwood Forest, Leisure park is a modern plantation, there is still an ancient tree known as the "Major Oak" associated with the area. The Trent in Nottinghamshire has a spectacular tidal wave or "Aegier". Well worth visiting. Lincoln is a smaller, old cathedral city to the east of the region, and well worth a visit for the cathedral alone, which some consider to be the most beautiful building in Europe. The castle also has one of the four surviving original copies of the Magna Carta. There is a fascinating old town with cobbled streets and unusual shops. Rural Lincolnshire has a variety of small towns, most of which are worth a brief look. In the spring Spalding hosts a bulb festival with floats made of Tulips. On the East coast the wildlife sanctuary at Donna Nook is an excellent place to watch seals, but check they will be there when they visit. There are beaches, but they tend to be chilly. This page was last edited on 22 September 2015, at 19:58.